I don't know how these quotable quotes get submitted and approved. 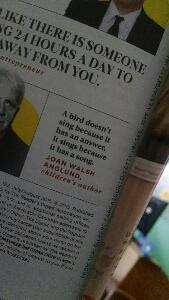 And I dont know this.. Joan Walsh anglund..
and went more like, "The caged bird doesn't sing because it has the answer, it sings because it has a song." she said something like, "I didn't originate that quote, but you know how writers are.. if you use it three times it becomes yours." And that doesn't alter my opinion of eat, pray, love as a masterpiece memoir.. or alter how much I loved Elizabeth's talk.. But it was a huge surprise and disappointment..
and so like, -why didn't you credit the source? I suppose it becomes almost impossible to maintain the connection between original author and great quotes and lines.. But that doesn't stop me from wishing we could; and thinking we should. Well.. that's the first I've researched and read about that controversary and the stamp and the quote, etc. -I'm late to a discussion that already adjourned.. But reminds me also how I heard one person credit Anne lamott with saying, /something like.. "Your mind is like a bad neighborhood, you don't want to go there alone"
but Elizabeth gilbert uses that in her talks..
-who earns the well deserved credit for that line?! I love it! like i said "VICTORY WARRIORS!" -thursday.